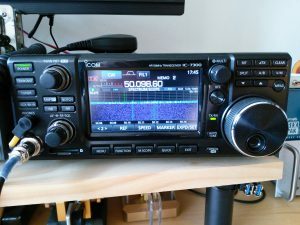 I thought I would write a few words about the loom IC-7300. I have had mine since Good Friday 2016 and have given it use on the air on various bands. 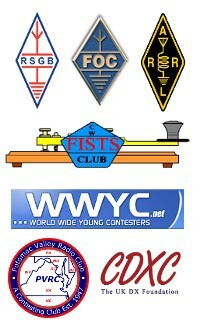 Primarily HF CW, but also RTTY and 70MHZ SSB and CW. When first powered it on it took a few minutes to get used to the user interface, the touch screen still catches me out from time to time. Mainly end up looking for a button for a few seconds before realising I should be tapping the screen! I should know better having an lcom IC-7100 too, but I haven’t used that rig very much and it’s different enough from the 7300 to be a new learning experience. Icom IC-7300 in the shack. I haven’t had it running in an SSB or CW contest on HF so not sure how good the strong signal handling will be in a crowded band – I have a K3 for that actually – but it is my intention to see how it stacks up in that scenario too. The built in band scope is great. Ok, so it’s not an Elecraft P3, but you can see the whole band or any part of. Fixed stare with marker tuning (even by touch!) or a fixed centre that moves the scope with the VFO dial. I prefer a fixed tune, so have altered the menu to focus the width of the scope on the CW end of each band. There are 3 settings here so you can have a whole band, and sub band segments, each with configurable edges. I have mine setup with the band scope filling as much of the screen as it can, but you shrink the scope or turn it off (WHY?!? ;-)). I also noticed the band scope doesn’t appear to be tuneable to the 5MHz band, even though the UK model is being opened up to transmit there by default from Icom UK. There is an audios cope too, both in time and frequency. This works on both RX and TX so you can see your transmitted waveform. I don’t use this as it takes up screen space that could be a band scope, but a funky feature for setting up the audio settings etc. The DSP filtering and noise reduction are pretty much the best I’ve heard, they make a big difference and are adjustable. No extra filters to buy. There is a mode, called IP+, to optimise the ADC in the presence of strong signals but I haven’t had to use that yet so not sure what difference it makes in practice. I plugged the USB cable (not supplied!) into the shack PC and within moments had a virtual serial port pop up and also a serial soundcard device. The serial port allows PTT, CAT and also CW and FSK keying from the PC. CW/FSK and PTT are done by using either RTS or DTR lines so should work with any software that can do those functions over the same serial port as CAT. My logging software doesn’t have a definition for the IC-7300, but I changed the 7300 hex C-IV address to match the 7100 and the command set works for logging and for Fldigi. I have had one RTTY OSO, on 17m, using Fldigi driving the internal soundcard in the rig and with CAT control. That was pretty cool. The rig does have a RTTY decoder in it and can take a keyboard input I think, but Fldigi is more versatile for different modes. All the levels were about right from factory default. A 25 minute RTTY rag-chew at 100W output only raised the temperature of the rig by a couple of notches on the bar graph and the fan didn’t speed up from normal in that time. I guess after a few hours of RTTY it’s be pretty warm, but the fan seems to be decent and Icom PA modules are usually rated pretty conservatively at 100W output for long periods. The internal ATU seems ok, it tuned a 6m HB9CV antenna on 4m, but I have resonant antennas at home so don’t need to exercise the tuner much. Its quoted range is 3:1, and certainly on a badly mismatched 4m and 6m antenna it won’t tune them. To be expected. So far I have only found one thing that bugs me a bit and it’s not unique to this rig. In fact when I noticed it I was reminded of my first HF rig, an Icom IC-746 – which I loved. The CW side-tone and SSB monitor levels in the menu only set the level relative to the main volume. I run a very quiet side-tone and what I find is when trying to hear a weak signal and turn the RX volume up then start sending CW I get a bit of a shock at the somewhat louder side-tone than I was expecting. My K3 keeps the side-tone at a fixed level irrespective of main volume level. To have only found one minor gripe is pretty good going. I am a fan of the Icom user interface experience, and the touch screen is pretty easy to get used to. There is an inbuilt speech unit to read out the frequency etc., but the touch screen, albeit sensitive, isn’t accessible for those who have partial or total sight loss. The virtual buttons have no tactile feedback etc. A while ago this probably isn’t something I’d have even noticed, but I think it is worth highlighting. There is also no IQ output on the back panel, for me that’s no problem but others seem to find it a problem. All in all it’s a cracking little rig, and it is quite small-size of the Icom IC-910 VHF rig. The new hand mic is nice and compact too and didn’t get any adverse audio reports during the few SSB contacts I have had with it. For the money I think it probably tops its class, I’ll be interested to see what the ARRL lab and Sherwood Engineering make of the receiver. The TX seems clean enough, but I did notice wideband phase noise on my K3 tuned to 15m when I was on 70MHz, but it’s not as dirty as a lot of transmitters out on the bands. On balance it’s great, but there are some features missing that you would find on a radio that costs twice as much. That’s the key. For the money I think it would be very hard to beat.